Paleo chili with blueberries is going to become your new favourite dinner. 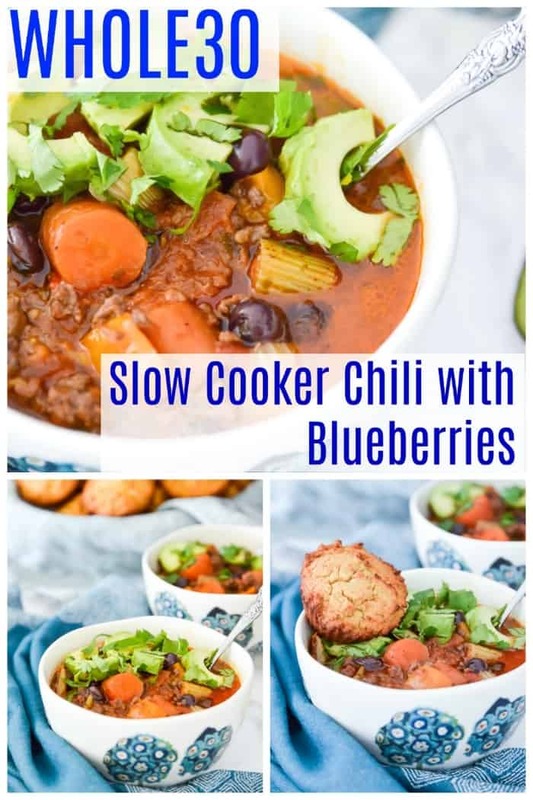 Not only is this slow cooker paleo chili with blueberries packed with flavour, it’s also loaded with vegetables so it is so, so healthy. Because it’s made in the slow cooker or crockpot this paleo chili with blueberries is also really easy to make. Your whole family is going to love it. I am so excited to share this week’s recipe with you guys. Paleo Chili with Blueberries. Yes blueberries! Am I a genius or what? Okay, maybe don’t answer that question, but I was trying to think of something that would resemble black beans, without actually having the gut aggravating effects that beans do. And blueberries were the perfect solution! It gives this chili a little something special. I really do think you are going to love it. You are going to love it even more when you realize how easy this chili is to make because it’s done in the slow cooker or crockpot. Basically throw all the ingredients in there and let your slow cooker or Crockpot work it’s magic. Easy peasy. Do you like chili? I love chili! Growing up I used to request my mom’s chili all the time. However, since going paleo and removing all beans from my diet, having traditional chili has been a little more challenging. I do have a couple other paleo and Whole30 compliant chili recipes on the blog including my Three Meat Raspberry Chili and Texas Slow Cooker Beef Chili, both of which are also pretty darn delicious. But neither have anything in them that resemble those beans that define a classic chili. So I was determined to think of an ingredient that would make this chili look like a more traditional chili recipe. And blueberries were my solution! 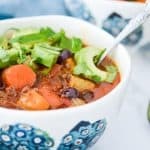 They also add a unique flavour to this paleo chili with blueberries that I think you are going to love. I also created a Paleo Cornbread Muffin recipe that pairs really well with this chili. Chili and cornbread, it doesn’t get much better than that does it? This Whole30 chili with blueberries is loaded with so many healthy ingredients. Ingredients like grass fed ground beef, bone broth, four different kinds of vegetables plus blueberries. Grass fed beef is actually one of the healthiest foods on the planet. Loaded with vitamins and minerals and with an omega 3 to 6 ratio of 1:1 to 1:4 it is a really anti-inflammatory food. Just don’t confuse grass fed ground beef with the regular ground beef that you find in the grocery story. They are completely different foods. The ground beef that you find in the grocery story that comes from factory farmed cows is actually really bad for you. I wrote an entire post on this topic called The Biggest Mistake You Can Make On The Paleo Diet. If you haven’t yet, I highly suggest you read it. Bone broth is also one of the best things you can include in your diet if you are looking to improve your health. It is great for gut health, skin health, nail health and hair health. It is also loaded with vitamins and minerals. Again though, make sure you aren’t making your bone broth with bones from factory farmed animals. You need to be using grass fed beef bones or pasture raised chicken bones. This is crucial! And if you aren’t quite ready to make your own bone broth yet I highly recommend getting it from Kettle and Fire. All you have to do is order online and they will deliver high quality bone broth right to your door! How convenient is that? It has blueberries! I know it might sound a bit crazy but trust me it’s delicious! First you are going to cook the grass fed ground beef. Place a medium pan on the stove on medium heat and add the 2 TBSP of cooking fat. Allow the fat to melt and then add the beef to the pan. Cook the beef until it is browned and no longer pink. While the beef is cooking, chop all the vegetables and add them, along with all of the other ingredients to your slow cooker or Crockpot. Then when the beef is done, transfer it, along with the fat it was cooked in to the slow cooker or Crock Pot and stir the ingredients well to combine. Then turn the slow cooker or Crockpot onto low heat and cook the paleo chili for 8 hours. Then serve and enjoy! I love topping this chili with chopped cilantro and avocado. Is this chili Whole30 compliant? YES! It’s also safe if you are on the GAPS or SCD diets as well. There is just one modification that needs to be made if you are on the SCD diet (see the recipe instructions). Do you have to cook the ground beef before putting it in the slow cooker or Crockpot? No you don’t. It just tastes better this way. You won’t get the same browned result if you simply throw it in the slow cooker. But if you are really pressed for time and want to skip the browning step you can. Just add the ground beef to the slow cooker or Crockpot along with all the other ingredients. Can you make this paleo chili in the Instant Pot? Bursting with flavour and loaded with vegetables this chili is a meal that your whole family will love.